Something odd happened to Britain in the 1970’s. The hippie movement was turning sour. Scientists furthered new environmental research and people began looking inward to their country surroundings. Urban sprawls butted against farmland, creating unsettling, unfamiliar spaces, and there was a surge of interest in dark folklore of the British Isles. The mantras of peace and love were abandoned. Innocence fled the fields. The peak of the folk horror movement in the 70’s left a taste in British mouths that we have never been able to get rid of, most vividly in fiction. 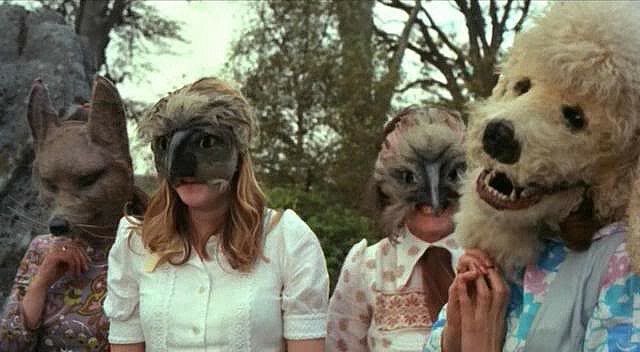 Still from The Wicker Man (1973). Image from Cryptic Rock. The notion of a terror from within toppled the reign of the ghoulish Hammer horrors and set the stage for films such as The Wicker Man and Blood on Satan’s Claw. No one was scared by Gothic castles adorned with clanking chains any more: the real horror was to be found right outside your front door in the piercing sunshine of the summer solstice. The most effective folk horror fiction puts nameless fears into words. It reminds us of our fear that, for all our quantifiable facts and study, there will forever be a shapeless realm like a veil between ours and whatever dead place lies on the other side. M. R. James was an early example of folk horror’s timeless appeal, penning several contributions to the genre in the early 20th century. His Ghost Stories of an Antiquary usually featured an unnamed narrator sat by a cosy fire in some Oxford clubhouse, relating a woeful tale of horror to rapt companions. James was fully aware of the power of bringing the supernatural into familiar surroundings. In James’s A View from a Hill, a scholarly archaeologist is called to the country to examine artefacts and finds a ghostly abbey, ruined during the Reformation, visible only through binoculars. Still from O Whistle and I’ll Come to You, My Lad (1968). Image from Moonbase Central. The dark forces still dormant in the fields around the abbey nearly kill him. In O Whistle and I’ll Come to You, My Lad, an affable gentleman named Parkin retires to the seaside for a restful break. On a walk, he finds an ancient bone whistle in a graveyard and, pleasantly unaware of the consequences, blows a note. It heralds the arrival of a featureless spectre that haunts him just beyond his scope of vision. The story was adapted for television in 1968, and traumatised the British public with a dream sequence involving Parkin pursued by the spectre along an endless stretch of bleak Norfolk coast. Folk horror even pervaded public service announcements which highlighted to children the danger of seemingly everyday situations. These broadcasts have become notorious, and many adults have been unable to shake their memories. 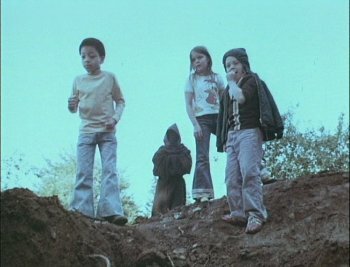 The Spirit of Dark and Lonely Water was one such film created to prevent accidental drowning, and featured a Grim Reaper-style hooded figure lurking nearby as children swam or attempted to retrieve a ball from a flooded quarry. Needless to say these broadcasts were very effective. Still from The Spirit of Dark and Lonely Water (1973). Image from Noise to Signal. The popularity of folk horror continues, with books such as Simon Maginn’s Sheep shining a light on the innate fears unique to British culture to this day. We are an island nation, naturally distrustful of strangers and blanketed by a beautiful yet perilous and often lonely countryside with a pagan past that has left little by which it can be understood. Our increasingly technological lifestyle means the forces of nature, seen and unseen, are more removed from our everyday lives than ever, and that leaves us wondering – were our solstice celebrations really as innocent as we once claimed? Bethany Scott is an author living in Scotland with her military husband and three civilian cats. You can follow her on Twitter @bethanyrscott and visit her blog.